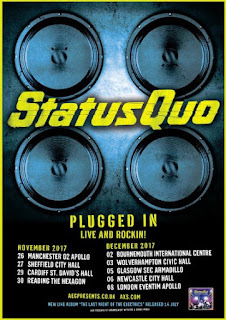 Status Quo has announced a new series of "plugged in" shows but admit it won't be the same without Rick Parfitt. This has been a year like no other and in many ways the band has felt out of control. Rick’s passing was a huge blow. Much of what we had planned was envisaged initially to accommodate what would be right for him – those sands have obviously shifted and now everything has changed. The band is not the same – it can’t be and shouldn’t be – and the plan has changed too. We’re still listening to the fans, we always have, and we’re hearing that this is what they still want. We’re going to give it to them. 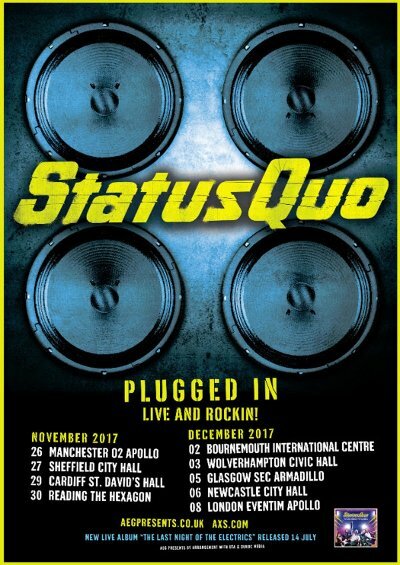 The current edition of Status Quo includes Rossi, who has been part of the band since 1962, Andy Bown (joined 1976), John "Rhino" Edwards (1985), Leon Cave (2013) and Richie Malone (2016). Last fall, the band played a number of European dates that were billed as their final electric performances but they have bowed to fan pressure for the Plugged In: Live and Rockin' Tour which will run from November 26 to December 8.